It has been a while since the last time I was in the kitchen cooking properly (no, cooking Indomie Goreng Cabe Ijo cannot be considered cooking because it only needs boiling water *lol). 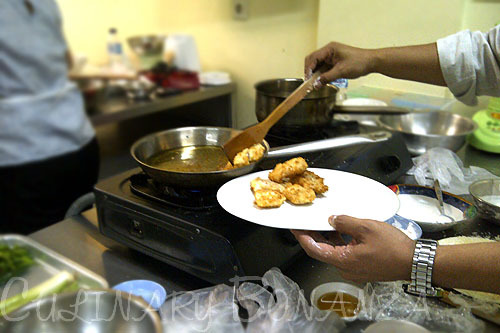 Alas last week, I finally had a chance to stretch my stiff arms in the kitchen of Jakarta Culinary Centre at Senayan. 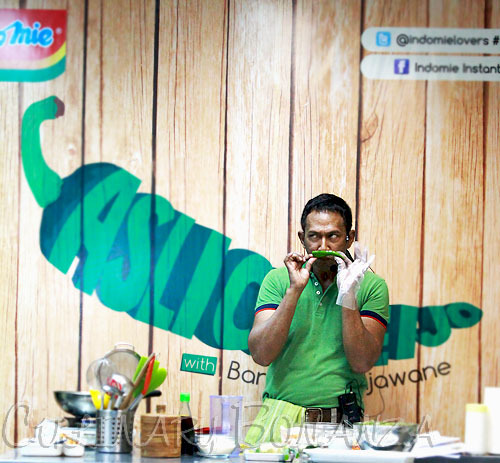 The event was a Cooking Experience with Bara Pattirajawane themed #AsliCabeIjo, sponsored by Indomie and the participants selected, came from quite a diverse background. 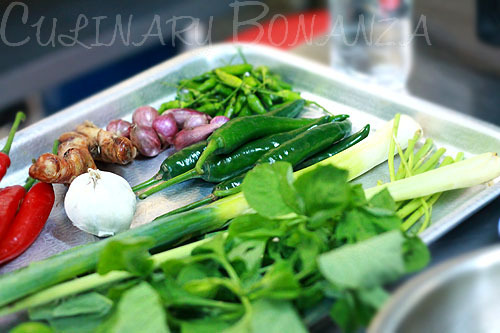 So, as you guessed it, our primary ingredient of the day was the green devil, cabe ijo. 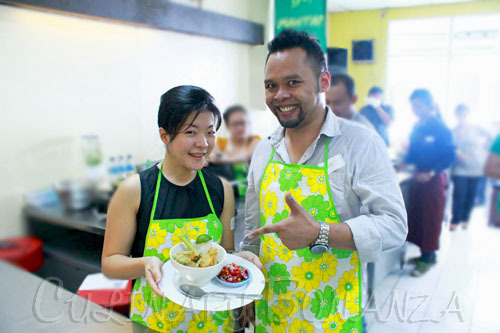 Bara Pattirajawane, an amiable chef on and off screen, demonstrated to us how to cook the recipe of the day: Kakap Goreng Bumbu Ijo (Fried Snapper Fillet in Spicy Green Gravy). 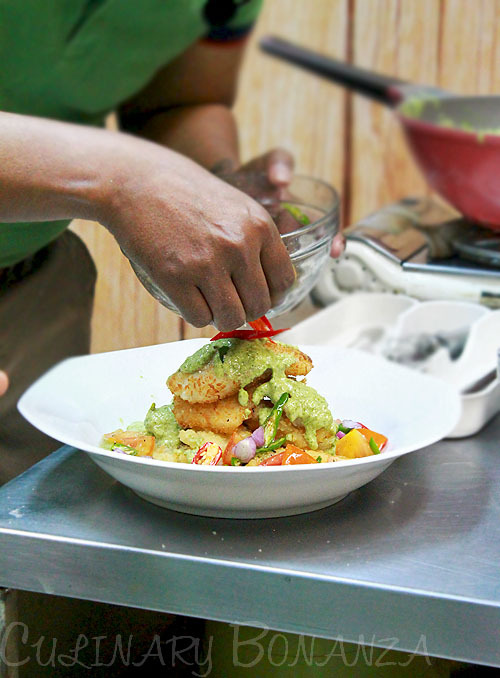 Then came our turn to cook and we were challenged to replicate the recipe within an hour. Now I understand the tension and agitation that participatns experienced in the cooking competitions often aired on TV. I was lucky to team up with Dicky from Ngiderngiler.com who was very accomodating and helpful. 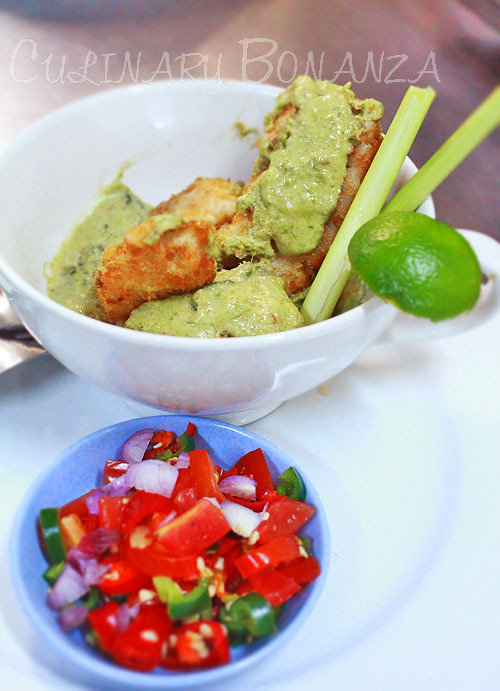 So we divided the task and Dicky fried the fish fillet, while I made the gravy base. 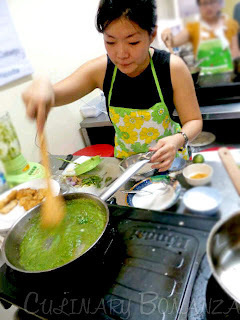 It was very hot with all the cooking, frying and boiling going on around us, plus the nonexistent airflow made my blouse as sticky as cling wrap, but all the cutting and chopping and blending with the electric blender (as opposed to traditional mortar and pestle) was a lot of fun! It had been almost entirely 'trial and error' endeavour. Like Bara said, a recipe is after all, just meant to be a guide. The final product of our experiment tasted and looked a lot better than I dared to expect (I was literally throwing in ingredients randomly!). Hi there, thanks for dropping by. =) Indeed it was a lot of (sweaty & hot) fun!